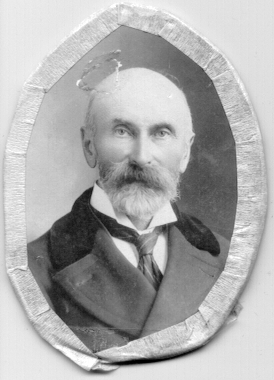 William Fraser was born in Enzie parish, Banff, Scotland, in 1839, the son of James Fraser and Ann Green. A carpenter by trade, he appears to have travelled extensively around Scotland, perhaps in search of work that was becoming increasingly scarce. He married Joanna Chisholm and his oldest children, Mary Ann, Isobella and William, were born in Inverness where he and his wife lived on Haugh Street. In 1869 he moved his family to the Isle of Lewis where he had the contract for masonary work on the new Sherrif Court House. Here the family lived in Stewart-Field and had another child, James Green Fraser. Sadly James died after eleven days and was buried by Fr. John Fraser, the Catholic Priest on Stornoway. The next year William and Joanna moved to the Isle of Sky where their next two children, Johanna and Alexander, were born. William worked as a contractor on County buildings in Portree and as a cattle dealer. After several years on Skye he then moved his wife Joanna and children William, Mary Ann, Isabella, Johanna and Alexander, to Canada in 1873 where he settled in Toronto. In his 47 years in the city he worked his way up to surveyor, builder, lecturer at the Toronto Technical School and finally, well known in building and architectural circles, he superintended the construction of many of the city's prominent buildings including the Old City Hall, University of Toronto's Convocation Hall, many of the cities bank buildings, Harbord Collegiate and Union Station (just completed at the time of his death). Family Home on Clinton St. He was the first vice-president of the St. Vincent de Paul Society and one of the first members of St. Francis Roman Catholic Church (later St. Agnes), where his oldest son would one day be parish priest. Indeed he seems to have been a very religious man with two sons becoming priests and two daughters becoming nuns. Altogether William and Joanna had eleven children, three dying in infancy. Their daughter Isabella lost her husband when he was thirty and she herself predeceased her parents, dying at thirty-seven years of age. William & Joanna's home on Grace St. He was also for many years trustee for St. Stephan's Ward on the Metropolitan Separate School Board. Joanna predeceased him by six months and he was in failing health from the time of her death. He was acclaimed in the Toronto papers as a genuine pioneer of the City of Toronto.